Sometimes just getting to the start line at a race is a victory. Winning the race, well that’s just gravy. After a promising start to her road racing career, two years ago, North Carolina’s Nina Laughlin came down with an illness that left her wondering when she would be able to race again. This year, after a long road back to health, Laughlin has found a home on gravel roads. 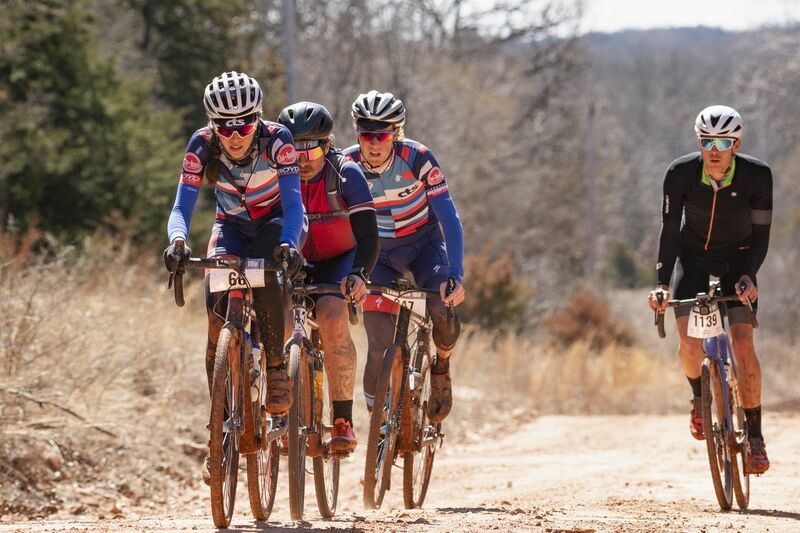 Earlier this month, she won the Southern Cross gravel race in Georgia, and last weekend, she headed for Stillwater, Oklahoma and the 2019 Land Run 100. The latter event was not necessarily in her 2019 plans. 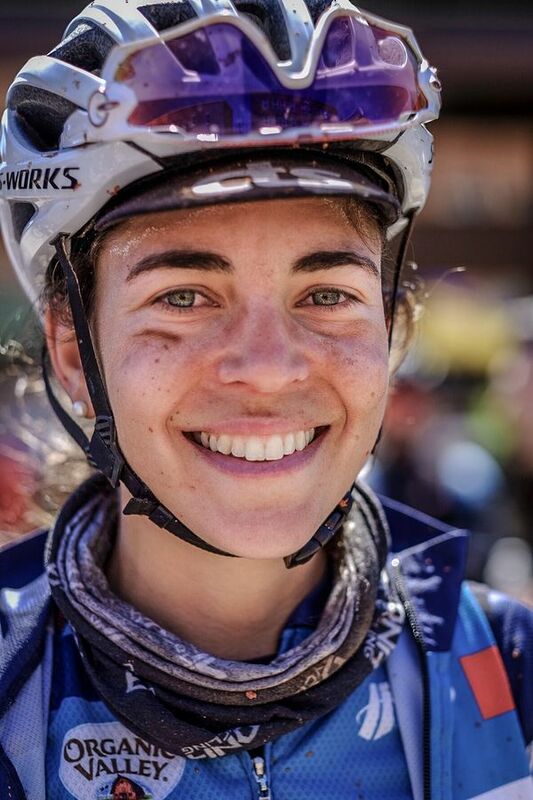 Despite a snub from the horrible person who wrote Cyclocross Magazine‘s race preview, Laughlin knew she had a good shot at being successful against one of the most talented groups of women gravel riders we have seen. Laughlin did her best to stay forward, even through the first really technical section, and halfway through the race, she saw that she was in first. For Laughlin, after everything she has been through, the feeling was indescribable. We interviewed Laughlin about her win at Land Run. See below for our conversation. For more Land Run 100 coverage, see our interview with Men’s winner Payson McElveen and a look at the race’s meteoric growth. Cyclocross Magazine: Looking in our archives, it looks like we saw you win a gravel race in North Carolina a few years ago. What is your background in cycling? Nina Laughlin: I went into college thinking I would try to walk onto the cross country team. I trained with them for a while but didn’t make the cut, so I bought a road bike my freshman year of college and started joining random group rides. My second semester, I joined the cycling team at Appalachian State University in Boone, NC. I really fell in love with the sport and started out mainly racing Collegiate road and cyclocross races. I started doing some local gravel racing in addition to the Collegiate racing around my Sophomore or Junior year. After school, I started working as a cycling coach and made my way to a few bigger stage races to see if I would enjoy racing at a higher level. I got picked up by Visit Dallas DNA Pro Cycling Team in late 2015 and rode with them again in 2016. I signed with Twenty20 Pro Cycling in 2017, but I only did one race with them because I was forced to take a break from cycling due to illness. CXM: (I think) I saw Cathy Fegan-Kim joke about you being “back” on social media. What kind of racing have you been up to lately? NL: Land Run was my second race in over two years, so not a whole lot. I raced professionally on the road from mid-2015 to the beginning of 2017, but then I got really sick in early 2017. My last race was Cadel’s Great Ocean Road Race in January of that year. After that, I couldn’t ride or exercise much at all until June of 2018. CXM: Why did you decide to make the trip for Land Run? NL: My fiancé Reid randomly perked up one morning and was like, “Let’s register for Land Run! Registration opens in 5 minutes!” True story. To be honest, I hadn’t heard of the race and was a little apprehensive because at the time of registration, I had only been back to riding for a handful of months, and I had no idea what kind of racing I wanted to get into for 2019. I’m always up for a challenge, so I agreed … but I made him buy registration insurance in case I didn’t feel up to it by the time the race rolled around. Turns out we didn’t need it. CXM: What were your thoughts when you saw the conditions—fast and dry versus the famed red mud? NL: I was stoked for dry and fast! The idea of that 103-mile course covered in mud and a 30-percent finisher rate terrified me. Thank you weather gods! CXM: What was your plan for the race? Did you have an idea of the women you had to keep an eye on? NL: I was pretty nervous because Land Run was my first gravel race with a huge, super strong field, and I had no idea what to expect. I wanted to make sure I got a good start position near the front, and my plan was just to surf wheels and hang on to the lead group as long as I could without completely imploding. I had no idea where my fitness was at for a 100-mile race, so my main goal was just to race smart and do the best I could on the day. I have only raced a couple of the women in the field in the past—Lauren De Crescenzo was my teammate in 2016. I knew to look out for Lauren, Amy Charity, Amanda Nauman and Scotti Lechuga, but I wasn’t super familiar with Kae [Takeshita] and Amity [Rockwell], whom you mentioned in your race preview article. CXM: How did the race play out for you? What was the key to getting such a large gap on the other women? NL: I stayed with the lead group until we hit the technical doubletrack section around Mile 20. We didn’t get that far in our pre-ride, so I had no idea it was coming. The race pretty much exploded there, and I just tried my best to ride that section as hard as I could and then find a good group to ride with after that to keep the momentum going. I thought that I might’ve been first at that point, but I wasn’t completely sure. When we got to the aid station halfway through the race, the race doubled back on itself, so you could see the groups that were in front of you and behind you. At that point, I knew I was in the lead. I saw Amy and Kae in a huge group not too far behind us, which made me a little nervous because I was only in a group of three. From there, the group I was in worked well together and ended up picking up some riders that had been dropped from the lead group. Going into the finish, we had a group of six or seven. In town, we got stopped by a red light, but I turned around and couldn’t see anyone behind us, so I was pretty sure by that point that I was going to win. CXM: How did it feel to win, especially knowing how big of a deal Land Run has become? NL: I can’t really describe it. I’ve been through so much in the last two years, and when I was sick I truly didn’t know if I would ever be able to race or train again. This is definitely my biggest win, and it feels surreal and incredible. Last March, if you would have told me that I would be winning a prestigious gravel race a year later, I wouldn’t have believed it. I still don’t really believe it, but I have been working very hard to get back in shape, and I knew if I rode my best race there was a chance I could win. I was really anxious the week before the race because I’ve still been struggling with some lingering issues from my illness, and I didn’t know how that would affect me, but it all worked out. I’m really grateful that Reid talked me into registering, and I’m grateful to Bobby [Wintle] and Sally [Turner] for putting on an epic event. I’m so stoked on gravel racing and I’m really motivated for whatever comes next! CXM: What bike did you ride? Tires? Aero bars? NL: I rode a Grava Maple Sally with i9 Ultralite wheels. I rode a Specialized Trigger Pro (38mm) in the rear and a Donnelly X’plor MSO (40mm) in the rear, which seemed to work well. No aero bars, because I left my TT bike at home. I also have a dropper post because I like to ride trails on my gravel bike, and you never know when you may want to get a little sendy. CXM: Do you have plans to do more gravel this year? Where should we look for you? NL: Yes! The next big one for me is SBT GVL. Leading up to that, I’m racing a lot of the NC gravel races—Bootlegger 100, Wilson’s Revenge and Pisgah Monster Cross are definitely on my calendar and maybe some others. Our local gravel scene has some incredible races, but they don’t really get the coverage or notoriety they deserve because they are limited to 200 participants due to NC Forest Service rules. I’m sure I may add some more races in as the season progresses, but those are my plans as of right now. CXM: Do you coach yourself? Have a coach? Is your program designed for gravel racing? NL: I coach myself. I am a coach at Carmichael Training Systems, so I kind of use myself as a guinea pig for a lot of the training that I give to my athletes. I used to be super rigid with my training and get upset if I missed a workout, but not being able to ride my bike for a year and a half really shifted my perspective on training and racing, so now my training is a little bit more relaxed with more room for fun and impromptu days off. For my personal training, I usually start with more general workouts to target different energy systems, and then I’ll work in more gravel riding or specificity leading into a race. CXM: Anything else we should know? NL: Just getting to the start line of the race was a victory for me. I almost didn’t make the trip at the last minute because I have been dealing with some hormonal imbalance complications from when I was sick, and it’s been causing some bad anxiety and depression lately. I didn’t know if it was worth it to throw myself into a stressful race situation where there were so many unknowns when I haven’t been feeling like myself at all. I ultimately decided to make the trip because I knew I would regret it if I missed it, and I had heard so many good things about Land Run 100. I had to use pretty much every sports psychology trick in the book to get myself to commit to driving all the way out to Oklahoma but in the end, it was worth it. Even though I wasn’t really on anybody’s radar as a contender, I knew I had it in me to have a great race, and I wanted to prove to myself that I could overcome the obstacles in my way and make it happen. I wanted to mention this because Land Run was the weekend after a very heavy week for the cycling community—we lost Kelly Catlin and Tate Meintjes—and I think it’s important to share the mental health struggles that a lot of athletes face. I don’t want to paint the picture that I came out of nowhere and this is some incredible comeback story. Sometimes just showing up is a victory, and sometimes people who are struggling can still win races and seem like they have it all together. CXM: Thank you for your time and thank you for sharing your story. Excited to see what’s next for you. NL: Thank you as well.